I’m on a roll with this new stamp set from Beth Duff Designs. The kawaii images are just too cute! I colored my images with alcohol markers and fussy cut them with my handy dandy Scan ‘N Cut. To give the edges a clean look, I went around them with a black Sharpie marker (quick tip – outline edges from the back side; you’ll be able to get into tight corners without ruining the pretty side). For the layers, I made a white A2 card base. I added a stitched rectangle cut out of pattern paper from Queen & Co. A smaller stitched rectangle was cut out of a piece printed with a digi-stamp from Beth Duff Designs. I also cut a strip of yellow cardstock with a stitched strip of ease die that would act as a tray for my sushi. Before assembling the pieces, I figured out the placement and stamped the sentiments. 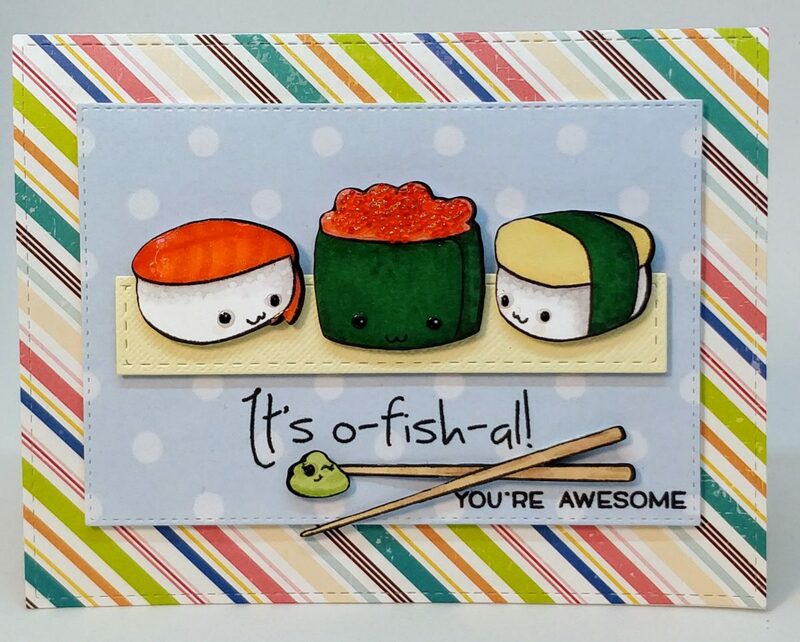 “It’s o-fish-al!” is included in the Roll with Me set; “you’re awesome” is from Lawn Fawn. 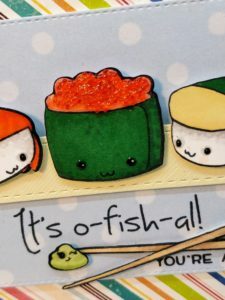 Check out the other sushi card I made with this stamp set!